Emory Healthcare is proud to welcome DeKalb Medical to the family, advancing patient care in the metro Atlanta community and beyond. On Friday, Sept. 14, partnership celebrations for employees, local leaders and government officials were held at each of the three DeKalb Medical locations, along with unveilings of new hospital signs at each facility. DeKalb Medical officially became a part of the Emory Healthcare system on September 1, 2018. As part of the integration, DeKalb Medical’s hospital on North Decatur Road is now named Emory Decatur Hospital; DeKalb Medical Hillandale is now Emory Hillandale Hospital; and DeKalb Medical Long-Term Acute Care at Downtown Decatur is named Emory Long-Term Acute Care. The partnership between Emory and DeKalb Medical brings together the best of both worlds – the discovery and innovation of an academic medical center together with a high-quality, deeply-rooted community health system. The two health systems initiated their requests for a partnership in November 2017 through a formal Letter of Intent. The Federal Trade Commission approved the partnership in March 2018. Then in early August 2018, the Georgia Attorney General’s Office announced the approval of the strategic partnership and integration of DeKalb Medical and Emory. DeKalb Medical is a not-for-profit health system consisting of three hospital campuses with a combined 627 licensed beds. It has 55 practice locations throughout DeKalb and Gwinnett counties, more than 800 doctors on its medical staff in nearly 50 specialties and 4,000 employees. 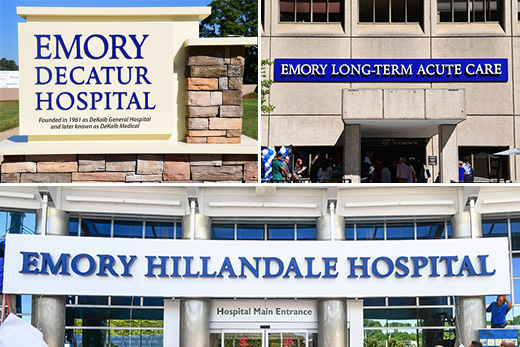 Emory Healthcare, a nonprofit organization, is the most comprehensive academic health system in Georgia, with seven hospitals and 200 provider locations in metro Atlanta and surrounding communities, including nearly 60 urgent care and MinuteClinics. It has more than 2,000 physician providers in 70-plus specialties, including more than 120 in primary care. With an additional 23 regional affiliate hospitals, Emory Healthcare has a footprint in more than 40 counties throughout the state.